Observe different steps of mounting work process for Urasenke tea ceremony school and initiate yourself into urauchi (backing technique). In Kyoto, the craft of mounting has developed due to the high demand provided by the sheer amount of temples and shrines, head families of the tea ceremony schools and imperial court. The high quality textiles used for mounting are also conveniently made in Kyoto Nishijin area. 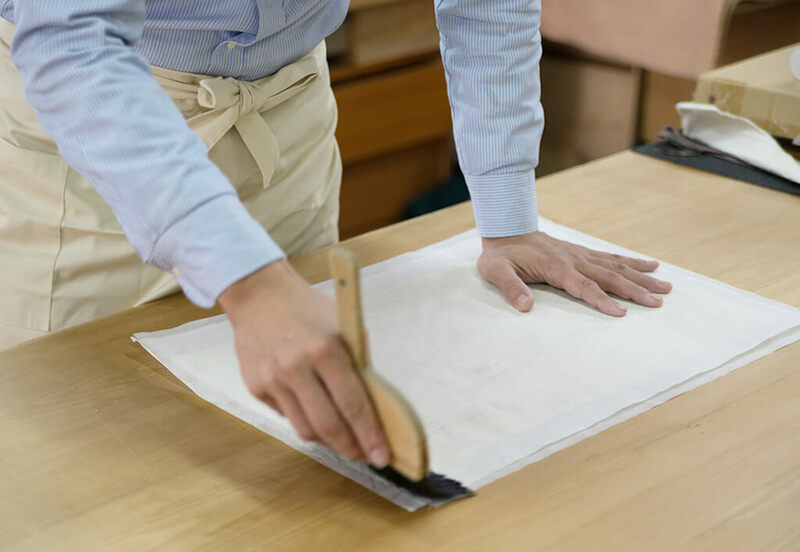 At Seikodo Nakajima, try your hand at backing (called “urauchi”), mounting technique consisting of applying paper or fabric to the back of a calligraphy or artwork while carefully flattening it as it dries. You won't be able to take home the work provided for backing experience, but you can always bring a calligraphy, picture or photo of your own (not larger than A4 size) and take it home after the workshop. In some cases, the photography of craftworks is prohibited. Please get the permission before taking pictures at the atelier.